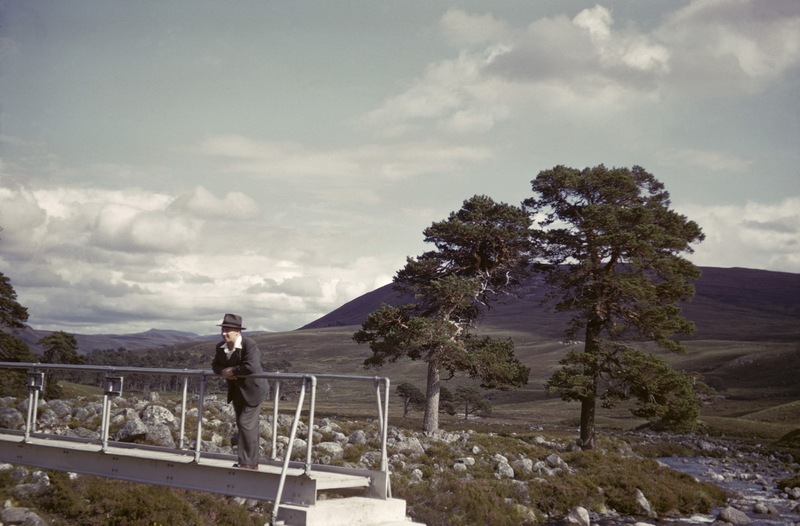 George Taylor of the Cairngorm Club on the brand new Luibeg Bridge, 1948. 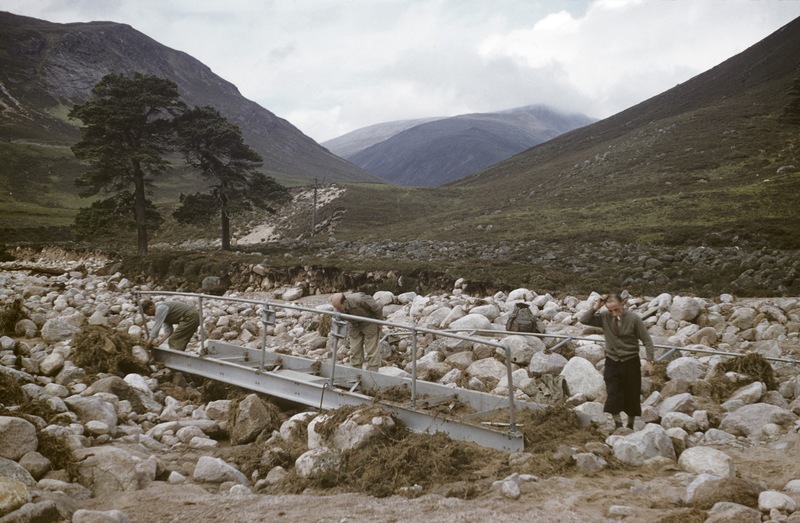 The present Luibeg Bridge, at 014943, was built by the Cairngorm Club (with assistance from builders) in 1948 – but not in that position. It was built more or less where the ford crosses today, perhaps a little downstream, at a traditional crossing site adjacent to a previous bridge formed of two tree trunks with a decking of planks, which had long since seen better days. 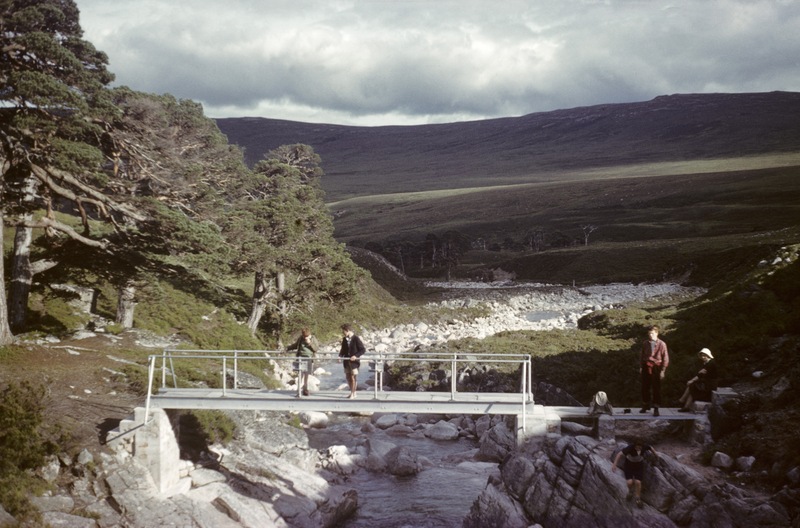 Having studied the burn in spate, the decision had been taken to raise it on stone piers so that the aluminium girders which formed the span were about two meters above normal water levels. However there are spates and there are spates, and in 1956 came a spate and a half. Bridge span, bridge piers and large portions of the banks were all washed away. You can see the piers still lying by the burnside. It was a disaster, but redeemed by the fact the bridge was salvageable. 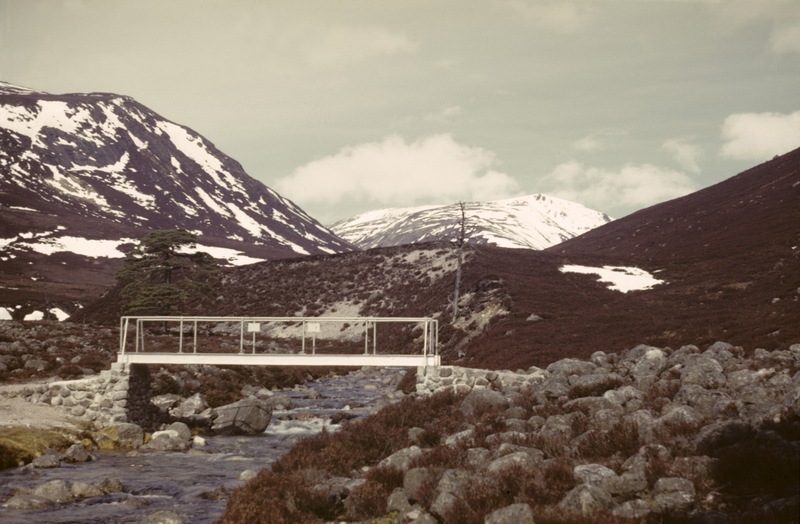 Girders were retrieved from where they lay and a new crossing point was chosen 500 metres upriver, where a narrow gorge through the bedrock gave solid foundations and a good height above the water level which has now stood the test for over 60 years. A new deck was added last year and it looks good for a long while yet. …now you don’t. 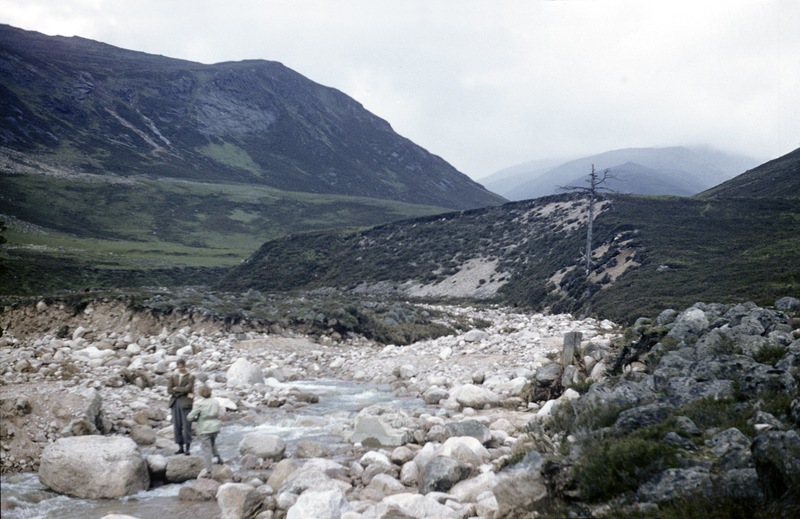 This is the same spot but the 1956 flood not only removed the bridge, it reshaped the whole area. 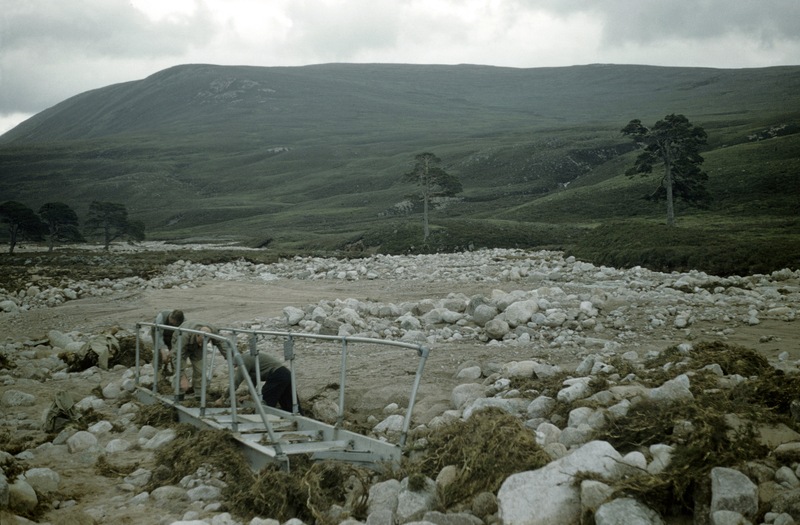 The bridge was deposited downstream, but in more or less once piece. Happy ever after. The salvaged bridge in its present site, a lovely spot and more secure. 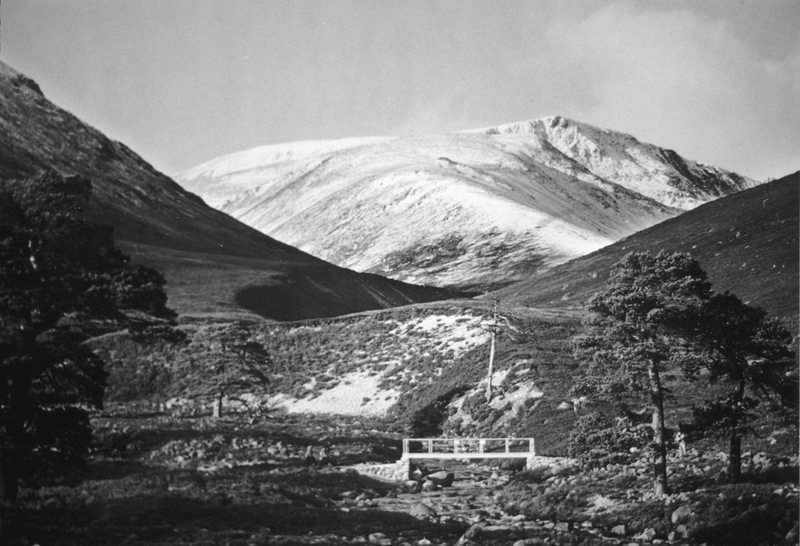 This entry was posted in History and tagged Bill ewen, Cairngorm Club, ford, George Taylor, luibeg, luibeg bridge. Bookmark the permalink. As ever…great work Neil . Brilliant set of photos! And sounds a great way to make a bridge – just lay two treetrunks and then slats across! Yeah, it was probably pretty shoogly though. And will have needed replacing more often. I love shoogly bridges – great fun! Very interesting Neil, but don’t the hills look bare, unless my memory fails me there are now more trees. Would be interesting to see up to date photos taken from the same spots. Yes, a lot more trees now in that area, though all relatively young yet. There was a deer fence around that area for many years and I thin a mixture of planing and natural regeneration. Might do a post sometime though on areas which have changed markedly over the years. I seem to remember getting round the deer fence, which stopped as it reached the river, by hanging on to the last post, and swinging round it, more or less over the river. Another great piece Neil. Thanks very much. Re the new growth of trees, what are these good folk doing around an old tree above Derry Lodge ? 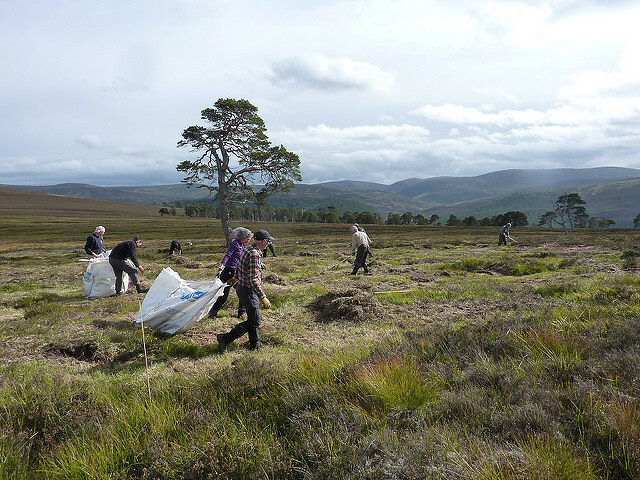 Answer – they are members of the John Muir Trust, brought in a few years ago to clear big patches of heather from around some of the individual Scots Pines above the general tree line. The NTS believes that these are some of their oldest trees, ( 400-y-o rings a bell ) and they wanted to improve the chances of them seeding. I’ll have to find time to go back, and see if it worked.